Whether it's a result of bad posture, an overuse injury, degeneration from aging, or trauma, neck pain can be rough. For some, pain may only last for a few hours, but for others it may linger for days. Chronic neck pain may continue for weeks, or even years. Your spinal column is composed of vertebrae, vertebral discs, and the spinal cord. The 7 vertebrae in the cervical spine are stacked on top of one another at the top of the spinal column. These structures serve to give the body support and mobility while protecting the spinal cord and nerve roots, which run from the spinal cord to the shoulders and arms. Vertebral discs separate the vertebrae in your spine, acting as shock absorbers for the spinal column by providing a cushion between the vertebrae. These discs are made of tough, elastic material that allows the spine to bend and twist naturally. Most neck pain is caused by issues with the muscles in the neck. This is often more mild pain, caused by muscle tension, cramps, or sprains. Poor posture can cause neck pain by forcing the spine into an incorrect position, so weight is distributed incorrectly. This can put pressure on the cervical section of the spine, or the neck. Neck pain can also be caused by wear-and-tear from aging or overuse through conditions like arthritis. This can cause degeneration that leads to nerve compression. 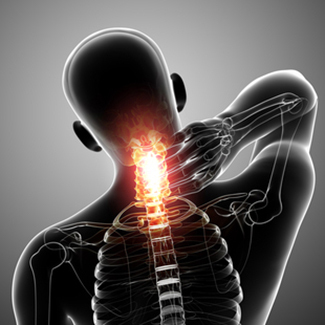 Traumatic injury can also causes neck pain. This can be through a sudden impact or blow, or from an accident like a car wreck, and can cause conditions like herniated disc. Disc-related problems in the cervical section of the spine can produce a variety of symptoms. These symptoms may include pain, arm weakness or numbness, and stiffness. There may also be changes in range of motion, balance, coordination, and fine motor skills. Options for treating neck pain depend on the pain's cause, so treatment varies. Some conservative methods may include bracing, physical therapy exercises, medication to reduce inflammation, and steroid injections. If conservative methods do not have an effect, or if the condition is very severe, surgery may be necessary.